Please find a copy of proposed changes to the WPC constitution. The extraordinary meeting to approve these changes will be held on Tuesday 13th January 2015 at 18:30 within the school. All Parents and Carers are welcome to our meetings. If you are unable to attend and would like to put forward a suggestions please email our Chair Lyn on parentcouncil@windygoul.elcschool.org.uk. This entry was posted in Events, Notices, Parent Council, School News on December 30, 2014 by Carina Herkes. The school show was Awesome. The cast had a lot of fun. It was an amazing experience. We liked all the songs. Everyone liked practices. We all enjoyed taking part. The costumes were amazing and we really liked performing in front of the parents. This entry was posted in Events, P7, School News on December 4, 2014 by mrmitchell. This entry was posted in Events, Primary 6, School News on December 4, 2014 by mrmitchell. 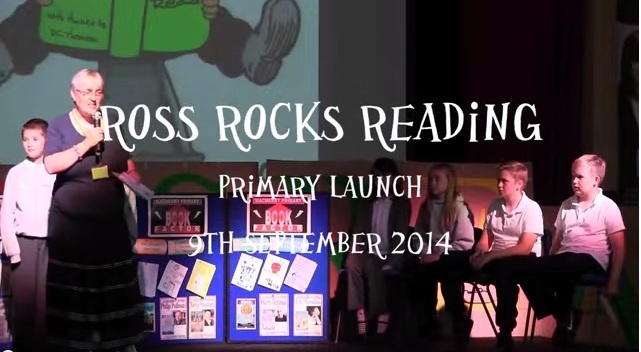 Last week Windygoul P5 learners took part in the launch of Ross Rocks Reading at Ross High School. This video lets you find out more about Ross Rocks Reading, at the start, and enjoy the contributions of all the different schools. This entry was posted in Events on September 18, 2014 by David Gilmour. This entry was posted in Events, Primary 1 news, School News, Uncategorized on April 12, 2013 by tbrown1. Tickets are now on sale for the P7 production of Scheherazade. This entry was posted in Events on November 23, 2012 by tbrown1. The Poldrate Arts and Crafts Centre in Haddington have organised a few Art related classes during the holidays. This entry was posted in Events, Notices on June 25, 2012 by Mrs Rees. Miss Innes is teaching some pupils how to use the school website. They will be learning how to write posts, make comments on posts and add photographs to posts. Keep checking the class pages to see what they have been up to! This entry was posted in Edubuzz Club, Events on May 16, 2012 by Miss Innes. This entry was posted in Events, Multiposts on March 26, 2012 by Admin (David Gilmour).